Website and processes: 8 Aug 18 Les G, 4/5 Good "Simple and Informative." 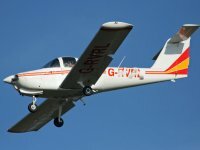 You will get a full brief from a qualified instructor before you do the flying! With the choice of routes down the coast or over the moors, get your hands on the controls of a Tomahawk for 30 minutes over the beautiful Devon countryside. Once a booking has been made please ring 1 hour before to check the conditions are suitable for your flight to take place. Maximum Weight 13 Stone, Maximum Height 6'4"
Not suitable for under 5's and over 100's.